Nearly two months after Typhoon Yolanda battered 12,129 barangays in the country’s 44 provinces, 57 cities, 591 municipalities in Regions IV-A, IV-B, Bicol, Western Visayas, Central Visayas, Eastern Visayas,Northern Mindanao, Davao Region and CARAGA, remain essentially the same. With victims of the super typhoon still facing Nearly two months after Typhoon Yolanda battered 12,129 barangays in the country’s 44 provinces, 57 cities, 591 municipalities in Regions IV-A, IV-B, Bicol, Western Visayas, Central Visayas, Eastern Visayas,Northern Mindanao, Davao Region and CARAGA, remain essentially the same. 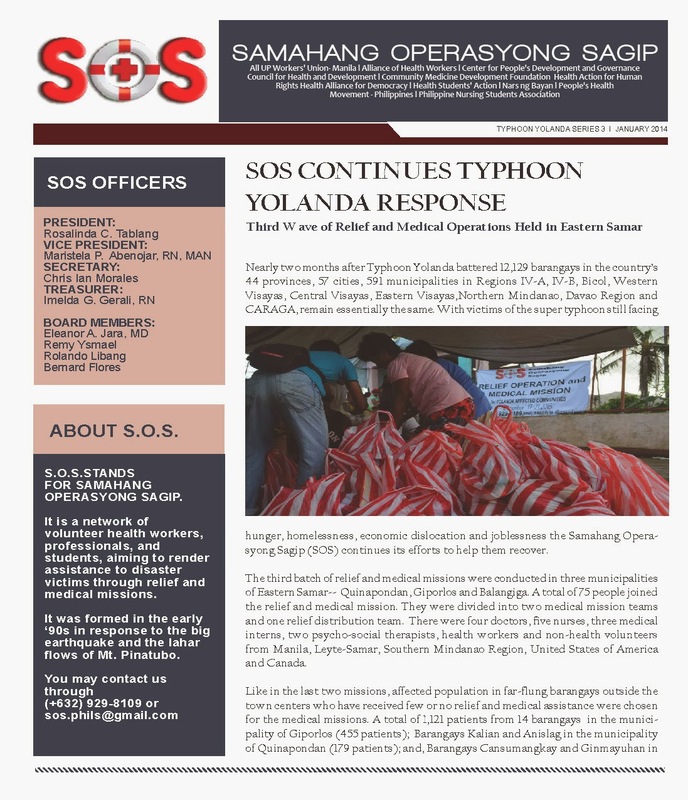 With victims of the super typhoon still facing hunger, homelessness, economic dislocation and joblessness the Samahang Operasyong Sagip (SOS) continues its efforts to help them recover. The third batch of relief and medical missions were conducted in three municipalities of Eastern Samar-- Quinapondan, Giporlos and Balangiga. A total of 75 people joined the relief and medical mission. They were divided into two medical mission teams and one relief distribution team. There were four doctors, five nurses, three medical interns, two psycho-social therapists, health workers and non-health volunteers from Manila, Leyte-Samar, Southern Mindanao Region, United States of America and Canada. Like in the last two missions, affected population in far-flung barangays outside the town centers who have received few or no relief and medical assistance were chosen for the medical missions. A total of 1,121 patients from 14 barangays in the municipality of Giporlos (455 patients); Barangays Kalian and Anislag in the municipality of Quinapondan (179 patients); and, Barangays Cansumangkay and Ginmayuhan in the municipality of Balangiga were served. The most common medical cases included upper respiratory tract infections, acute gastro-enteritis and hypertension, tension headache among adults; and fever, diarrhea, cough and colds among children. These ailments were also observed in the first and second waves of SOS medical missions in Eastern, Western Samar and Leyte provinces. other hand, benefitted 2,376 families from 13 selected barangays in the towns of Quinapondan, Giporlos, and Balangiga. They were able to receive relief packs, clothes, plastic sheets, building materials like nails, saw, and hammers. The mission team also gave hundreds of Christmas Goodies Packs for children. Six water filtration pails were given to representatives of the barangays in the towns of Giporlos and Balangiga. 1. Government’s relief and medical assistance should include far-flung barangays. Many communities especially those located in the upland received very little assistance while many shared that they have not received any assistance at all. 2. There is a great need to provide assistance for people to rebuild theirhomes and communities, through provision of construction materials including GI sheets, nails, hammer, saw, etc. The government should reconsider the Department of Trade and Industry (DTI) program of selling GI sheets that is beyond the capacity of the affected population. 3. Immediate and comprehensive health interventions to address potential sources of outbreaks and epidemics. These include immediate clearing of debris, provision of safe/potable water source, construction of shelter, provision/ assistance in food production and livelihood.